The St Andrew Bay pass jetty is more like a close family friend than a collection of granite boulders. The rocks protect the inlet ensuring the vital connections of commerce and recreation. One of the treasured spots along the jetty is known locally as the “kiddie pool”, which is accessible from St Andrew’s State Park. 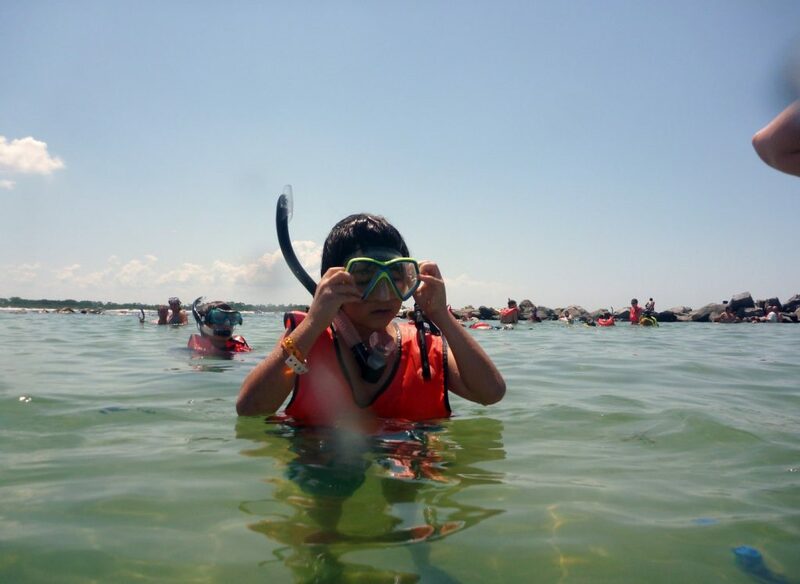 There are similar snorkeling opportunities throughout northwest Florida. Jetties provide an opportunity to explore hard substrate or rocky marine ecosystems. These rocks are home to a variety of colorful sub-tropical and migrating tropical fish. 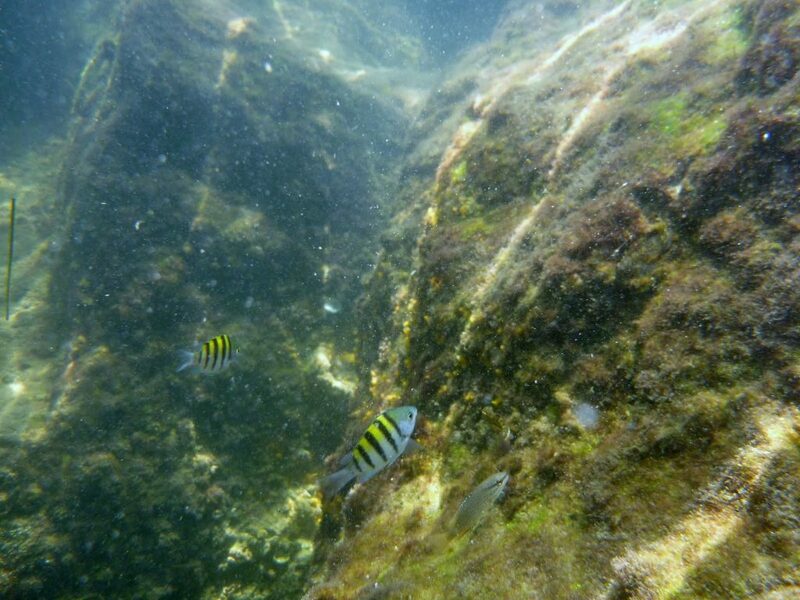 Snorkelers and divers who visit are likely to see a variety fish like sergeant majors, blennies, surgeon and doctor fish, just to name a few. Photo by L Scott Jackson. Exploring a jetty is more like a sea-safari adventure than an experience in a real swimming pool – it is a natural place full of potential challenges that first time visitors need to prepare to encounter. 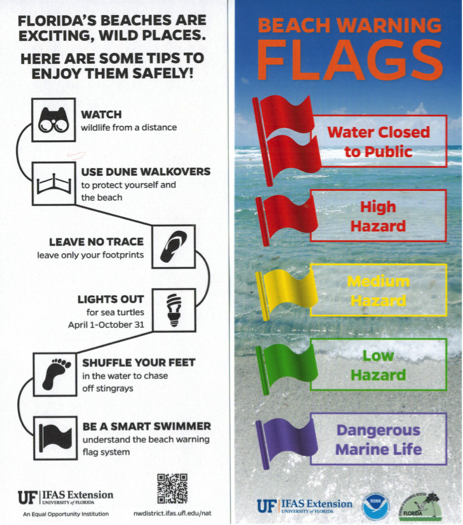 Divers and snorkelers are required to carry dive flags when venturing beyond designated swimming areas. These flags notify boaters that people are in the water. Brightly colored snorkel vests are not only good safety gear but they help you rest in the water without standing on rocks which are covered in barnacles and sometimes spiny sea urchins. Dive booties also help protect your feet. I found out the hard way! A couple of years ago my foot hit against a sea urchin puncturing my heel. The open back of my dive fin did not provide any protection resulting in a trip to the urgent care doctor. My daughter later teased it was an “urchin care” doctor! Sea urchin spines are brittle and difficult to remove, even for a doctor. Lesson Learned: “Prevention is the best medicine”. After a couple of weeks of limping around and a course of antibiotics, I recovered ready to return one of my favorite watery places – a little wiser and more prepared. I now bring a small first aid kit, just in-case, to help take care of small scrapes, cuts, and other minor injuries. Gloves are recommended to protect hands from barnacle cuts and scrapes. Shirts like a surfing rash guard or those made from soft material help keep your body temperature warm on long snorkel excursions. Along with sunscreen, shirts also protect against sunburn. Finally, know the swimming abilities of yourself and your guests, especially when venturing to deeper areas. It’s good to have a dive buddy even when snorkeling. Pair up and watch out for each other. Be aware that currents and seas can change dramatically during the day. Know and obey the flag system. Double Red Flag means no entry into the water. Purple flags indicate presence of dangerous marine life like jellyfish, rays, and rarely even sharks. Local lifeguards and other beach authorities can provide specific details and up to date safety information. 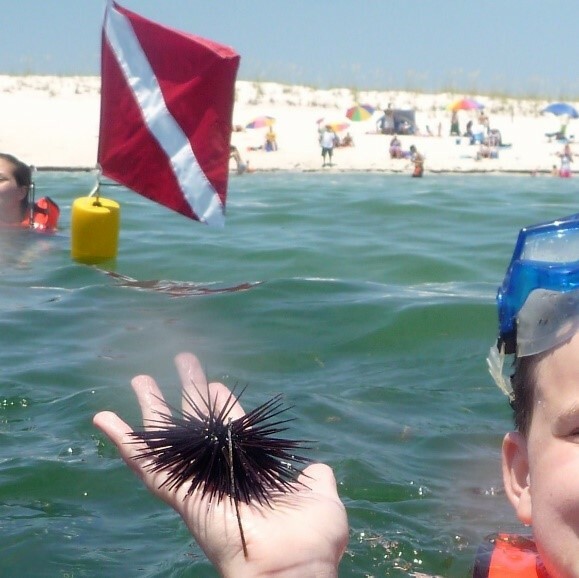 Follow these beach safety tips for helping your family enjoy the beach while protecting coastal wildlife.